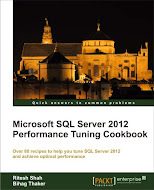 I am actively running my blog SQLHub.com from March-2009 and have started participated actively in Experts-Exchnage.com from the April-2009. From the month of May 2009 I was in the list of top 5 experts in few zones like SQL Server, SQL Server 2005 and SQL Server 2008 etc. 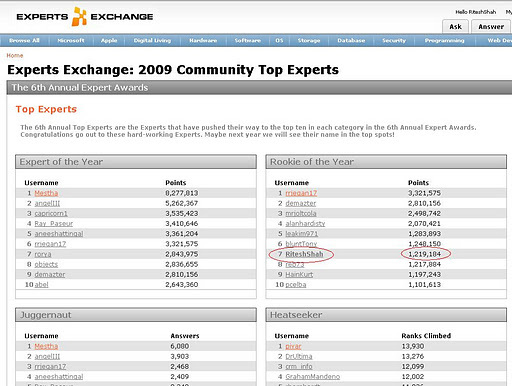 Finally today experts of the year list came out from Experts-Exchange official and I am really very glad to see my name in the TOP-10 Expert of year. Since last two months I am really very busy with heavy work load but this name in TOP-10 list encouraged me enough to participate more with community and reach to more and more people. I have learned lot of things from community so I consider it my duty to helping more and more people. Thanks to everybody who always encouraged me in my mission especially Mr. Pinal Dave who never let myself stop helping people. He is real source of encouragement and inspiration.